Beloved children’s author Jean E. Pendziwol (Once Upon a Northern Night) has written her debut novel for adult readers. 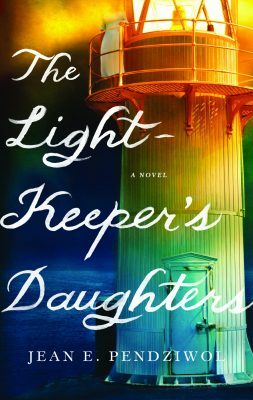 Here is a sneak peek at The Lightkeeper’s Daughters, coming from HarperCollins on July 4. I listen to the words spoken by the girl. Like the raindrops falling outside, one by one they fill the gaps until the memories pool together and flood through me. I can see Pa moving through his duties at the light, picture him as a young man, resurrected by his phrases. It is an existence he chose and one to which he was so well suited. The girl speaks, but I can hear his voice, too. It surfaces and floats past, deep and warm. Resonant. I realize that Morgan has stopped reading. “Have you reached the end, then?” I ask, and set my teacup down on the table beside me. A smile tugs at my cheeks. She is spunky. I stand – I have been sitting too long and my limbs are stiff – and make my way across the room to my bed. Sitting down on it, I bend to remove my shoes. Yes, the pictures. There are three of them and I can see them now as if my vision had not faded. They are early pieces, very early, before the world fell in love with her detailed lines and bold colors. I drop my shoes to the floor and swing my legs up onto the bed. I wish I knew. I am privy to few details of his life after we left Porphyry. He had disappeared by the time I was well enough to look for him, to demand answers. But I’m not sure I would have even if I could. I heard later that he moved to Sault Ste. Marie and took a job with Algoma Steel. A few years after Emily and I went to wander the world, he moved back. He worked many jobs, never able to stay long at any one, harvesting wood to feed the paper mill, hammering nails to build houses, even hiring on as a deck hand with Paterson Steamships. He built Wind Dancer himself, and sailed her single-handed for months on end out on the Lake. He knew that boat intimately. The Lake, too. I never could have imagined him coming to this… But he was too old to be out on Superior, alone. “So you hated him.” It is the simplicity of youth, framed in black and white, right and wrong, love and hate. Excerpt from The Lightkeeper’s Daughters by Jean Pendziwol © 2017. Published by HarperCollins Publishers Ltd. All rights reserved.